Urban renewal of Naples in the 1920s and 1930s was not as extensive as the great Risanamento of the previous decades, but it was nevertheless impressive. This included the transformation of the area of Santa Marta, corresponding to the present-day San Giuseppe Carità district (the area around the main post office, (pictured, right). Construction was intense, opening new streets and putting up new buildings, most of which were built on the premises of the Mount of Olives monastery, one of the largest in Italy, with a history going back to the 1400s. 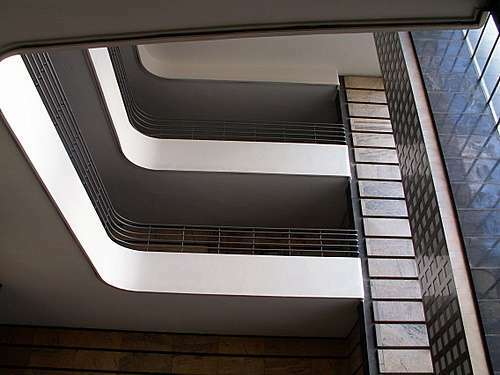 The bidding for a new post office was announced in 1928; the new building would replace the post office then housed in Palazzo Gravina, now the Architecture Department of the Frederick II University of Naples. The announcement outlined the area for the post office as that section of the city to the north-west of via Armando Diaz then occupied by the large Mount of Olives monastery. The post office would take up about half of the monastic grounds and save and incorporate the courtyard (pictured, above) and surrounding monastic quarters with their vaults and arches. The ancient sections, today, seem to flow out of the newer marble of the post office, producing a startling and not at all unpleasant anachronism. The rest of the Mount of Olives territory continued on up almost to via Toledo, where there were more monastic quarters and the Mount of Olives church, itself, (mentioned above, it is now known as the church of Sant’Anna dei Lombardi. The monastery section in back of the post office as well as the one further up by the church are now police barracks. The church remains a church. 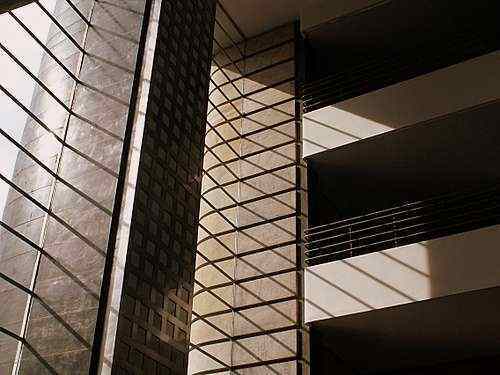 Many architects participated in the competition; the winner was Giuseppe Vaccaro, who designed a monumental building that fit right into the school of Fascist architecture in Italy. 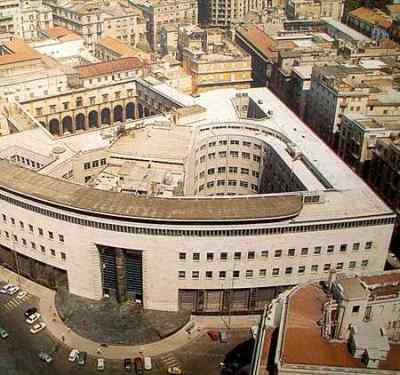 The plan also called for the laying of a new large square in front of the building, now Piazza Matteotti, itself now ringed with other examples of the same style of architecture. The post office, has a large semi-elliptical façade with two entrances on either side of a large pseudo-column, all faced with black granite and grey marble. 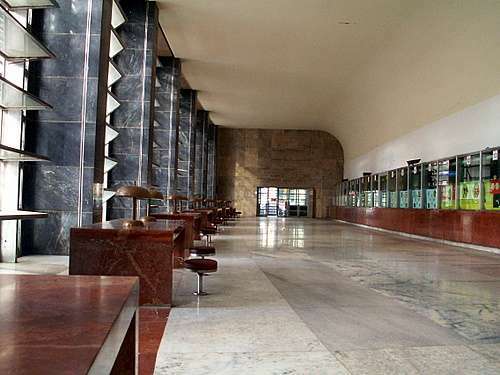 The interior displays marble, brass and glass mosaics and is a study in late Art Deco design of the 1930s. 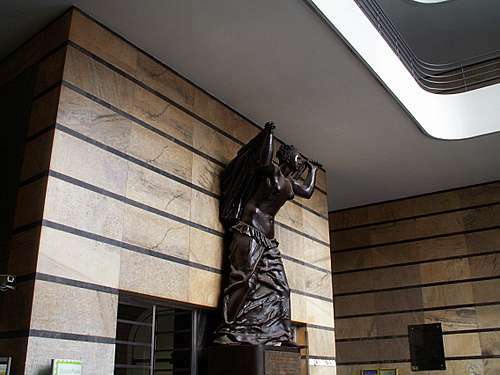 In the hall of the main entrance stands a bronze statue of Victory (photo, upper left, below) to mark the victorious end of the 1915-18 conflict (WWI). It is by the sculptor, Arturo Martini. The post office was inaugurated on September 30, 1936.